More or less the scrapped "bootleg" album by Neil Young in 77. Probably in my top 5 Neil albums, which is saying a lot. Huge story behind it, but the truth of the matter is that it just rules. Neil Young was on a creative high in 1975. By the end of the summer, Zuma was finished, though still not released. Yet Neil carried on recording his new songs. Sometimes he recorded solo and sometimes with Crazy Horse. Lots of these songs would remain unheard by the public until quite a while later, but by late ’75, Neil had already written and recorded versions of such future classics as Like A Hurricane, Powderfinger, Sedan Delivery, Pocahontas and Ride By Llama. He carried on recording in 1976. More great songs were put down on tape, such as Will To Love, Stringman and Campaigner. Some of us may feel that the Long May You Run album with Stephen Stills robbed us of the natural successor to Zuma, but Stills always suspected that Neil was holding back his best stuff for his solo album. That solo album was a work in progress throughout this period. Titles were reported in the press: Ride My Llama, In My Neighborhood, American Stars ‘N Bars, Chrome Dreams. When American Stars ‘N Bars was released in 1977, Neil had scrapped most of the material he’d been recording since late ’75, replacing much of it with a series of rough hewn cowboy songs. Fun stuff to be sure, but had Neil committed the latest in a series of difficult to explain career suicides? Who else, except maybe Bob Dylan, would sit on a stash of such quality songs and not let the public hear them? 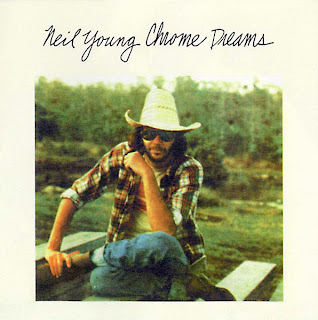 Tracks 1 to 12 of this compilation are thought to be the unreleased Chrome Dreams album, readied for release weeks before Neil recorded those country hoedowns and rethought his strategy. Some of these song titles will be more than familiar to you, but the actual performances may surprise you. Powderfinger is performed as an unadorned solo acoustic song; Sedan Delivery, a second song destined for Rust Never sleeps, is presented in its pre-punked up arrangement and, in many people’s opinion, sounds all the better for that. You’ll also find the definitive Stringman, a song not given an official airing until Neil’s Unplugged set, heard here in a 1976 live performance enhanced by subtle yet beautiful studio vocal and guitar overdubs; Hold Back The Tears is another solo performance, longer and more ghostly that its later remake for American Stars ‘N Bars; Pocahontas is the same performance as the one that made Rust Never Sleeps, but in its original "Naked Mix;" Too Far Gone wouldn’t be officially released until the Freedom album in 1989, yet here’s a version from 14 years earlier with Poncho Sampedro adding a tasty mandolin part.